The TOMS Shoes 4th Annual One Day Without Shoes day on April 5th is asking you to spend a portion of your day barefoot to raise awareness of what it’s like for so many people around the globe who have no choice but to go barefoot every day and the impact a pair of shoes can have on a child’s life. This year, model Anne V and TOMS Shoes will be hosting a 10 minute barefoot walk on Pier 45, Christopher Street Pier (located between Christopher St and West 10th St, off the West Side Highway). Come on….you can do 10 min. right?? 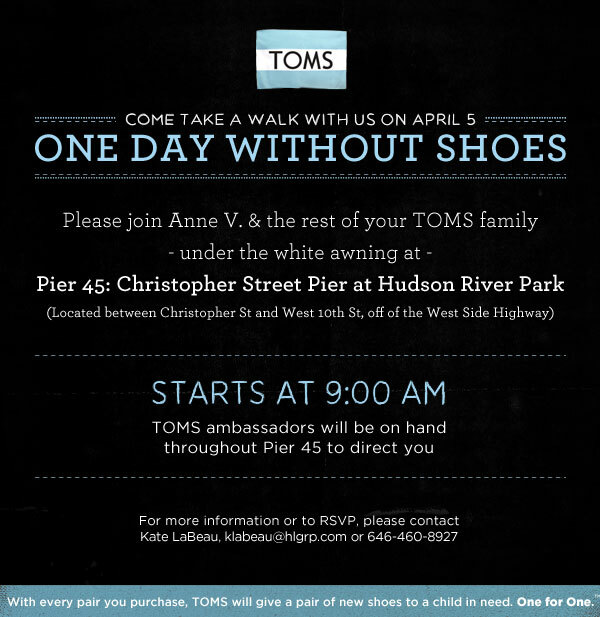 Meet a TOMS rep at 9am under the white awning and walk barefoot to raise awareness. A small breakfast reception will follow at the nearby Sweet Life Café (147 Christopher St b/w Greenwich and Washington). I know….it’s NYC BUT…for 10 minutes, you can know what it’s like to truly Walk in someone elses bare feet. Everywhere you look these days, someone one or some brand is now “in the bridal business”. I’m seeing so many, that it’s confusing and frustrating me. What’s not news (even though they have just launched a bridal collection) is Loeffler Randall is the queen of shoe style. Loeffler Randall was born out of designer Jessie Randall’s quest to find the shoes that she wanted to wear but could not find – shoes that possessed an understated elegance, were well made, and undeniably feminine. After outfitting brides in past seasons, Jessie Randall, creative director and designer, decided it was time to bring Loeffler Randall’s chic, downtown aesthetic to the bridal market to respond to the many requests received for a bride’s special day. There are picks for every type of bride including those looking for a vintage aesthetic, to whimsical, to edgy and of course the traditional. You can also go the range from flats to booties to stilettos in whites, silvers and nudes, and fabulous textures like metallic snake-skin. I especially love that she has some cute flats that are perfect for that beach or garden wedding. Kiss those flip-flops good-by!